If your system feels out of balance due to emotional stress and you haven't experienced improvement with meditation and relaxation sessions, you may find this professional grade botanical formula to be immensely helpful to your overall sense of well-being. Adrenal Refresh is a whole food botanical formula that's specifically designed to correct imbalances created by stressed endocrine and nervous systems. Adrenal Refresh is crafted from a patented extract of ashwagandha root and leaf that has been clinically shown to help the body recover from negative effects related to chronic emotional stress, and has long been used for this purpose by practitioners of Ayurvedic medicine. Adrenal Refresh also contains rhodiola, a botanical which has long been used in traditional Chinese and Russian medicine to help support chemical imbalances, particularly cortisol levels that are out of normal range due to alterations in adrenal function. 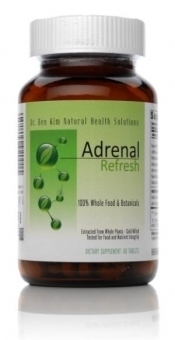 I've experimented with a number of similar botanical formulas with clients over the years, and Adrenal Refresh is the one that I have found consistently produces the best results, even in cases of severe adrenal exhaustion brought about by many years of chronic emotional stress. Why is emotional stress one of the most significant causes of all chronic health challenges? Because your body cannot defend itself against the damage that emotional stress silently creates over time. Your body pays a heavy physiological price for every moment that you feel anxious, tense, frustrated, and angry. Speed up and intensify your heart and breathing rates, so that you could have more oxygen and nutrients available to your muscles to run or fight. Divert the bulk of your blood supply to your large muscles groups to run or fight. Slow or even shut down your digestive system so as to not waste blood, nutrients, and oxygen that could be used to run or fight. Stimulate the release of extra glucose into your blood to give you a burst of energy. Cause your adrenal glands to release epinephrine and norepinephrine to increase cardiac output and increase blood sugar. Stimulate the release of cortisol from your adrenal glands to increase blood sugar and energy. Increase the diameter of your pupils to allow for more light to enter your eyes and more acute vision for fighting and running quickly on any type of terrain. Clearly, it is to your advantage to have a healthy sympathetic nervous system and healthy adrenal glands so that you are fully capable of experiencing all of the functions listed above during physical emergencies. What you don't want is for your body to experience all of the above on a continuous, low-grade level because of emotional stress. And this is exactly what many of us are suffering from in today's hectic world. There's really no need to provide a list of health conditions that are partly caused by emotional stress, because every health condition is partly caused by emotional stress. Emotional stress always equals increased output by the sympathetic nervous system, which always equals accelerated aging and breakdown of your tissues. I recommend trying Adrenal Refresh if you have already tried applying the following six suggestions to your daily life and still feel that you need extra support to re-establish healthy baselines for your endocrine and nervous systems. Doing so can actually decrease the tone of your sympathetic nervous system and increase the tone of your parasympathetic nervous system, which is the portion of your nervous system that promotes relaxation and good digestion. All three have been scientifically proven to facilitate a relaxation response in your body that can decrease blood pressure, decrease pulse rate, and improve blood circulation. Meditation and relaxation sessions can be greatly enhanced by listening to any number of audio CDs that are designed to facilitate optimal relaxation and mental clarity. The one that I use on a regular basis and highly recommend is called EarthRain. Almost all great athletes practice some form of visualization. As author Wayne Dyer says, "you'll see it when you believe it." Spend some time each day visualizing yourself going about your day in a balanced and emotionally poised manner. You can include visualization in your prayer/meditation/relaxation sessions. Your nutritional status can make all the difference between being able to handle a certain amount of stress without breaking down vs. quickly suffering health problems when faced with stress. While it's important to your overall health that you eat a well balanced and nutrient-dense diet, for emotional health specifically, it is important to ensure adequate intake of B vitamins, Vitamin D, and two long chain omega-3 fatty acids, DHA and EPA. There's a reason why know thyself is a proverb in virtually every culture of our world. Striving to know yourself and what you are feeling on a daily basis is absolutely essential to preventing unpleasant but genuine emotions from becoming chronic states. Anger, frustration, and anxiousness can all help fuel personal growth and character development if you are honest with yourself and seek to discover their root causes. One of the best methods I can recommend to increase your awareness of what you are feeling is journal writing. The rules are simple: no censorship, no possibility of another set of eyes being able to read your thoughts, just pure flow of thoughts from your mind and heart onto a piece of paper or your computer screen. Regular journal writing in this manner can be extremely beneficial to your emotional health. It's a well established fact that regular exercise is one of the best habits you can adopt to help you avoid depression and stay emotionally balanced. It doesn't matter what kind of exercise you do. What's important is to be active and use your joints and muscles on a regular basis. If you find that regular application of the six measures noted above is not enough to help you feel emotionally balanced, I think it's worth your while to try Adrenal Refresh, as I've seen it make a significant difference for some of the folks that I've worked with. While it's fine to take Adrenal Refresh on continual basis, I generally recommend using it for a period of 3 months to provide the momentum that is often needed to restore balance to the endocrine and nervous systems. During this 3-month period, I recommend concurrently following the six suggestions noted above, and after this period, to try going without Adrenal Refresh and observe if you're able to maintain a strong sense of emotional balance without supplementation. 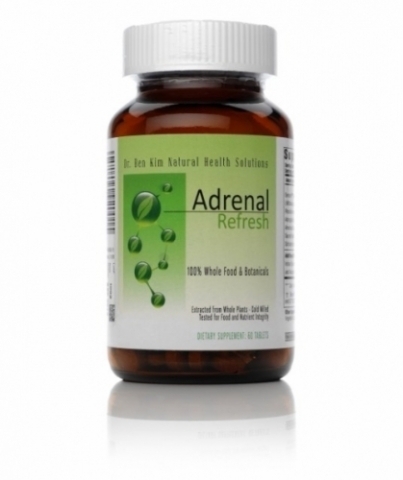 How is Adrenal Refresh different from other adrenal formulations? There are many adrenal formulations available to health care practitioners and patients, but most of them contain glandular tissue from animals. Adrenal Refresh is 100% vegetarian and in my experience, even more effective than animal gland-based formulas. What is the primary ingredient in Adrenal Refresh? Ashwagandha (Withania somnifera) is the primary ingredient in this formula, and has long been used in Ayurveda for its tonic, strengthening properties, and particularly for its ability to restore vitality in those suffering from being overworked or emotionally exhausted. The Sanskrit name for ashwagandha refers to a horses’ strength and is considered the “workhorse” botanical in Ayurvedic medicine. 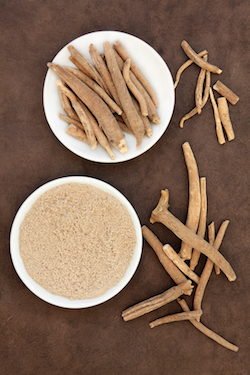 Why is the Sensoril form of ashwagandha used in Adrenal Refresh? Most formulations that include ashwagandha for adrenal health have about 1,000 to 2,000 mg of ashwagandha. Sensoril is a potent extract that has been shown to improve the body's response to intermittent stress and low energy levels at dosages as low as 125 mg. In most formulas, the ashwagandha concentrations are typically very low, approximately 1.5% withanolides. Sensoril is the only form of ashwagandha that is concentrated to 8% withanolides, 5.3 times more concentrated than most ashwagandha concentrates. The active constituents of Sensoril in their patented ratios have been shown to reduce elevated levels of circulating adrenocorticotropic hormone (ACTH) and thereby stem the concurrent increase in glucocorticoid levels, returning them to normal. This activity may protect the body from the negative effects of chronic stress, and balance metabolic function. What makes Adrenal Refresh effective if it does not contain glandular tissue? The body of scientific research on Sensoril is so extensive and compelling that Sensoril has been substantiated to the FDA in accordance with the requirements of the Dietary Supplement Health and Education Act. Sensoril is the only ashwagandha extract approved for structure/function claims. Also, Sensoril was the subject of a 2005 multi-phase, double-blind, placebo controlled human clinical trial using both objective and subjective criteria. The Sensoril treatment groups showed perceptible, statistically significant improvements in both objective and subjective features when compared to the placebo group. 1. Serum cortisol levels reduced by up to 26%. 2. Reduction in fasting blood sugar up to 9%. 3. Reduction in lipid profiles (total cholesterol, LDL, VLDL and triglycerides). 5. Increase in serum DHEA by 17.8%. 5. Greater levels of mental cognition. 6. Increased general feeling of overall well-being. 7. Reduction of stress symptoms. What are the supportive botanicals included in Adrenal Refresh? Rhodiola acts primarily on a section of the brain called the hypothalamus, which functions to help the body respond appropriately to stress. Research also suggests that rhodiola is helpful to people who suffer from poor appetite, difficulty sleeping, irritability, and a wide range of mood-related disorders. Ginseng is known to support adrenal function and have a calming effect on an overstimulated nervous system. Ginseng is also known to enhance white blood cell activity, so is often used to help to strengthen a compromised immune system. Astragalus is an herb that is used in traditional Chinese medicine to support immune, adrenal, pituitary, and bone marrow functions. Holy basil has long been used in Ayurvedic medicine to support cardiovascular, immune, adrenal, and digestive functions. Schizandra berry is used in traditional Chinese medicine to support kidney and liver function, and is also thought to be helpful for insomnia. This fruit is revered by the Chinese culture as a powerful digestive tonic. Please note that Adrenal Refresh should not be taken while pregnant, nursing, or if you are on medication for hypertension unless you have been given consent by your personal physician. 1. Sensoril is protected under US Patents Nos. 6, 153, 198 and 6,713,092 and is a registered trademark of Natreon, Inc.
Disclaimer: The information provided above is for educational purposes only and not intended as medical advice. The statements in this document have not been evaluated by the FDA. This product is not intended to diagnose, treat, cure or prevent disease. I have gone through my first bottle and am ordering another. Still haven't felt much different, but am willing to give it another go! I was taking these and feeling great. Then, out of the blue, I now have problems swallowing pills, no matter the size or if it's a gel or capsule. It feels like the pills are "stuck" in my throat or sometimes a little farther down. And it stays like that for hours no matter how much I drink or swallow really hard, or trick my throat by swallowing pills with yogurt! Very uncomfortable feeling! I used to swallow the biggest capsules EVER until recently, and would take several of all sizes with each meal. I had the barium swallow (nothing seen), then visited a gastroenterologist and all she did was give me Rabeprazole (which is a PILL not to be chewed!!) for heartburn/GERD I do not have! So, I've been buying tinctures, powders, chewing pills that can be chewed, and opening up capsules into some yogurt so I don't waste all the expensive supplements I had when this started (including ubiquinol gel cap$). I will have to do this with Dr Kim's Adrenal Refresh, I hope it doesn't taste too terrible with yogurt or applesauce, lol! (But, I really wonder about my R alpha lipoic acid capsules, though . will that hurt the lining of my gut if there's no capsule? It's not extended release.) I will not - for sure - take extended release pills this way. I'd be grateful for any feedback on this from others who have/had the same issue. BTW, swallowing food is no problem, so I have to wonder if it's something "mental" I've developed about taking pills. Sigh. Thanks so much! After I got off my prescription for depression (worked with my doctor on this as Dr. Kim advised rather than go about it by myself), I started taking this and am very happy with the changes that I have felt. I used to get very irritable and didn't know why. Worse yet I felt helpless like I had zero control over my outbursts. Yes I have a stressful job but that didn't fully explain why I had such wild swings. I felt so bad for my children who I could see were distancing themselves from me. This has made such a huge difference to the quality of my life. My eternal thanks, Dr. Kim! I have struggled with adrenal fatigue for a long time and had been working with my Naturopath for months seeking relief from lack of energy and chronic infections with little improvement. I switched over to Adrenal Refresh from a bovine-based adrenal support product and noticed a difference almost immediately. I highly recommend Adrenal Refresh and have noticed a marked improvement in my energy levels, sleep quality and immune system function. I use this product in conjunction with your Greens, Vitamin D drops, Vitamin C powder, and others. Thank you Dr. Kim for another great product!